● ప్రవేశం కల్పించే తరగతి: ఇంటర్ మొదటి ఏడాది. ● గ్రూపులు: ఎంపీసీ, బైపీసీ, సీఈసీ, హెచ్‌ఈసీ. వీటితో పాటు ఐఐటీ/ఎన్‌ఐటీ, నీట్‌కు ప్రత్యేక ఉచిత శిక్షణ అందిస్తారు. ● అర్హత: మార్చి 2019లో పదో తరగతి పబ్లిక్ పరీక్షలకు హాజరవుతున్న తెలంగాణ రాష్ట్రానికి చెందిన గిరిజన బాల బాలికలు మాత్రమే అర్హులు. ● పరీక్ష తేదీ: ఫిబ్రవరి 10, 2019. ● దరఖాస్తుకు చివరితేదీ: ఆన్‌లైన్/ఆఫ్‌లైన్‌లో జనవరి 21, 2019. Note: All the above notified seats in (02) COEs & IIT Study Centre will be filled through the Entrance Test and in case of SOE,Khammam the left over seats (after filling with the passed out 10th class students from the respective institution) only will be filled through the entrance test. 1.All the ST students (Boys & Girls) of Telangana who are appearing for SSC March - 2019 in TW Residential Schools, Ashram Schools, Govt. Schools, Zilla Parishad Schools and other Govt. Recognized schools and they should have secured at least B2 grade(7 points) in aggregate and also secure B2 grade in English in SSC Public Examination 2019. 3. Parental Income should not exceed Rupees Two Lakh per annum for urban and 1.5 lakh for rural or as per the Government guidelines by the time of admissions. 4. Selected candidates have to produce necessary certificates like, Caste, Income, Ration card, Aadhaar card, Marks Memo, Study, T.C; Physical fitness certificates, 06 Passport size photos at the time of admission. 2. Only the meritorious students from the 1st screening test will be permitted to attend 2nd level screening test. 3. 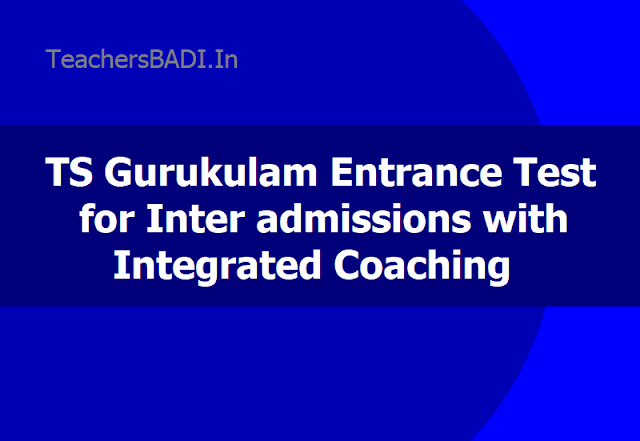 The list of eligible candidates for 2nd screening test can be obtained / seen from the website of Gurukulam. 4. The test will be based on the knowledge of subjects from class VIII to SSC in English / Mathematics/Biology/Physical Science. The entrance test question paper will be in bilingual (i.e., in English and Telugu Media). 5. Applicants can select any language as medium for writing the Test. Selection Process:The selections will be made on merit basis through Screening Test at two levels conducted by TS Gurukulam.The 1st Screening test will be objective type and2nd Screening testwill be descriptive type. Only the meritorious students from the 1st screening test will be permitted to attend 2nd level screening test. After the 2nd level screening test the selected students will get admission into 1st year Intermediate with integrated coaching for JEE Main/Advanced, EAMCET along with all benefits which extended by TS Gurukulam such as free boarding, lodging, Uniform, note books & text books, bedding material and examination fee etc. 1. Selection of students for IIT Study Centre, Rajendranagar, Hyderabad shall be made on the basis of State Common Merit for Boys only. 2 Selection of students for SOE & COEs shall be based on the merit in common Entrance Test following the reservation norms for Girls. S. No. District Test Centre and Convener with Address Phone No. Last date for submission of applications through ONLINE is: 30-01-2019*.